There was a time that the 1th, 2nd and the advanced didn’t existed and the asana’s were taught one after another. The first Westerners receiving teachings from Shri K Pattabhi Jois have been instructed in this matter. Somewhere in that time, the introduction of Asthanga yoga to the west, Shri K Pattabhi Jois systematized the sequence further and divided it into separate series, and each with a different focus. From that time on, the series has had several changes, asana’s were taken out (janu sirsasana D), others put in (parivritta parsvakonasana). Malasana was abandoned, which used to have a key function in connecting the 1st with the 2nd series. Malasana stretches the ankles, groins, sacrum, lower back and hips. Tones the belly and can provide relief from lower back strain. Stimulates metabolism and digestive organs. Squatting was very much part of the daily life in India in those days, and luckily still is (to a lesser extend) , and this pose wouldn’t have been considered a difficult pose. For most western people it does seem to be impossible (without use of a belt), sitting in a squat position, wrapping the arms around the knees and joining the hands on the back, + keeping the heels on the floor. Squatting a couple of times a day keeps the pelvic floor healthy and strong. (it is pushing abdomen in and down). In the pelvic area are two cavities, the deepest one, in the narrow bottom part between the hip bones, keeps the bladder, reproductive and bile organs. The upper one, separated by a membrane, contains the small and large intestines. The pelvic floor has a hammock shape keeping the organs together and nice in position. When organs are compressed, which will happen with pelvic prolapse/weak pelvis, it can lead to cancerous cells, (cell compression in general can lead to cancer). Maybe good reasons to fit malasana into your (daily) yoga asana practice. Malasana with bending forward is a counter pose after the setu bandhasana and prepares for another version of the squat pose, pashasana, with an added twist. 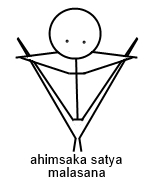 Pashasana is now considered the first asana of the 2nd series. Variation B is wrapping the hands around the heels, bringing the top of the head closer to the floor and rounding the spine more. The pose described here, and used to be in the ashtanga series, and also described in Iyengar’s; “light on yoga”, is a variation of squatting. There is variation A) taking the arms around the knees and joining them on the back. B) taking the hands around the heels, and bringing the chin to the floor. Both symbolize surrendering and the arms are like a garland around the legs. Often the upavesasana, the regular squat pose, with the hands in namaskar mudra in front of the chest, and the feet wider apart, is translated into English as the garland pose, as both poses are similar. Though, as yoga describes that in this posture, the intestines are in the best position to release all waste that is left after digestion, the upavesasana can be be also named Malasana, referring to the meaning of Mala = excrement, primarily stool. In transliteration from Sanskrit into English, where the English is lacking a proper writing for the long “aa” and short “a”. Mala can refer both to Mala, or Maalaa. This entry was posted in Uncategorized and tagged asana, India, practice, Religion and Spirituality, Sanskrit, Squatting position, Western world, yoga. Bookmark the permalink.